— Futuristic Blogger — Professional Blogger 10 Years Strong. Founder of TheShadeFiles.com and creator of “I’m So Insecure” Podcast show. (HBO Insecure) Futuristic Blogger is currently ranked Top #5 Atlanta Blogger by Cision. Futuristic Blogger is the former Editor in Chief at HipHopNews24-7.com and former Editor of True Magazine, The Black Urban Times and HipHossip.com. Futuristic Blogger website reached over 180,000 members & subscribers internationally on every populated continent. 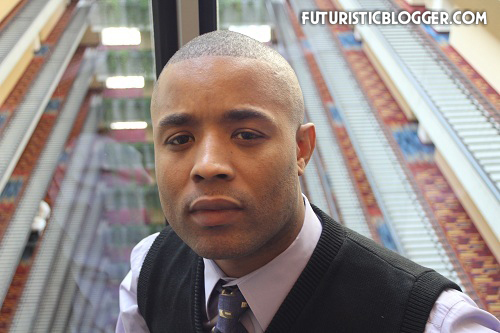 Futuristic Blogger has become one of the most influential bloggers to document hip hop culture. Carving his own niche by presenting stories with unique viewpoints but from a mainstream perspective. Futuristic Blogger has been featured on BET.com, XXL.com, Vibe Magzine, The Source Magazine, Yahoo.com, AOL BlackVoices, TVOne, Rickey Smiley Morning Show, Dr. Boyce Watins, Hellobeautiful.com, Necolebitchie.com, Mediatakeout, WorldStarHipHop, Thisis50, AllHipHop, Ozone, HipHopDx, Rap Radar, 2Dopeboys, Jumpoff Tv, Bossip, GlobalGrind, HipHopwired, Funk Master Flex, Missinfo.tv, Concrete loop, YBF, RealTalkNY, Dimewars, DatPiff News, HipHopStan, Karen Civil, StraightFromTheA, TheUrbanDaily, HipHopConnection, HipHopRuckus and many more. Futuristic Blogger is well known within the entertainment community for his tough questions and hard-hitting interviews. Since 2007 Futuristic Blogger interviewed Big Sean, Future, Waka Flocka, Big K.R.I.T, Shawty Lo, Young Money, Maybach Music, G.O.O.D Music, Bad Boy, CTE/USDA, Grand Hustle, G-Unit, Lloyd Banks, Red Cafe, Nipsey Hussle, Fred The Godson, Trae The Truth, Dizzy Wright, Dre Flims, Lil Chuckee, Lil Webbie, Short Dawg, Triple C’s, , G-Unit, Black Rob, Spice 1, Gunplay, Torch, Masspike Miles, Serius Jones, Blood Raw, Jay Rock, 40 Glocc, Trick Trick, DJ Scream, Blind Fury, Black Child, Field Mobb, The Outlawz, Jacki-O, Rasheeda, Princess (of Crime Mob) and many more. Futuristic Blogger has been featured on Atlanta’s Radio Station V-103fm, Houston’s Radio Station The Box 97.9fm, Atlanta’s HotspotATL.com and Detroit’s HotHipHopDetroit.com. My first thing is to congratulate you on such a anglo dominated business and how can i be a contributing writer to this blog, do you ever give opportunities for those coming thru the game the way that you have.